Drummer and multi-instrumentalist Steven Howells was born in Wales in 1961, grew up in South Africa and now lives on Oahu, Hawaii. He started playing drums and guitar as a teenager in Johannesburg, South Africa, and played in a host of influential bands covering a variety of styles, from the firebrand rock of The Asylum Kids (voted SA’s best live act in 1981 and releasing 2 critically acclaimed LP’s), the visionary world music of What Colours, and the urban two-tone beats of The Dynamics who toured Southern Africa and released an album recorded at Hugh Masekela’s mobile studio in Botswana. The Dynamics toured the UK in 1985 and garnered glowing reviews for their unique style and energetic live performances. After a year spent getting back to the roots, (literally, working on an organic farm in Dyfed, Wales), Steven returned to South Africa with a new vision for life working with social programs on food growing projects in impoverished areas during politically charged and turbulent times. He infused a new energy into some of Johannesburg’s coolest bands, gigging regularly and recording with Khaki Monitor, (one of the 1st progressive SA bands to sing in Afrikaans). He played the afro-beat with Zulu guitarist Noise Khanyile and his Joburg City Allstars, jived with SA’s most dance-able outfit Winstons Jive Mix Up, rocked and funked out with cultural icons The Cherry Faced Lurchers, (who backed up The Kalahari Surfers) and played hybrid country/punk with Archie Pelago. It was with these bands that Steven started working with the independent progressive record company Shifty Records as a session drummer. One of his first sessions was on the classic album Big Beat by the legendary Radio Rats. He toured South Africa with the Voelvry movement, which spearheaded a new cultural Afrikaans movement opposing apartheid during the push for democracy in SA. He also worked as tour manager and musical director for an HIV/AIDS awareness program that toured South Africa in the late ’80’s. Steven moved to Cape Town in the early ’90’s and worked as a sound engineer and played drums with the Mother City’s most vibrant and influential bands. This included the crossover funk, latin jazz and soul of Ngoi, the deeply emotive songwriting of the Heather Mac Band, the driving blues rock of the Groove Kings, and the funky new beat of The Dynamics, reformed and revamped, who released the CD Organic in 1996. Steven emigrated to Hawaii in 2000 and he now plays drums with some of Oahu’s finest musicians. All Jammed Up was a North Shore based latin jazz/rock fusion outfit, and it was while playing with them that Steven’s drumming was noticed by other Hawaiian performers. Steven played and toured with Makana, with whom he met guitar maestro Steve Inglis. He was a founding member of the cutting-edge Swampa ZZ trio and he rediscovered his love of the African groove when he played drums with Mabanzi Marimba, a unique ensemble playing the music of Zimbabwe. With his Welsh bloodline he brought his powerful drumming into the sound of Honolulu’s Celtic rock flag-bearers, The Doolin Rakes, and played tin whistle and bodhran on the more traditional Celtic tunes. Steven’s drumming is featured on songwriter Brian Von Ahsens CD release The Brian Show. He provided the beat for New Orleans heavyweights Anders Osborne and Kirk Joseph for a Halloween gig in Honolulu. In 2014 he played an energetic 10 date stint with South Dakota based Onward Etc. In autumn 2015, Steven toured Europe with Joshua Tree based 3rd Ear Experience, with the live recording and DVD gathering critical acclaim. In addition to his own project The Space Kadets, he currently plays with Serpico and the Sinners, Raised by Wolves, Seven Sails and the Stephen Inglis Project. 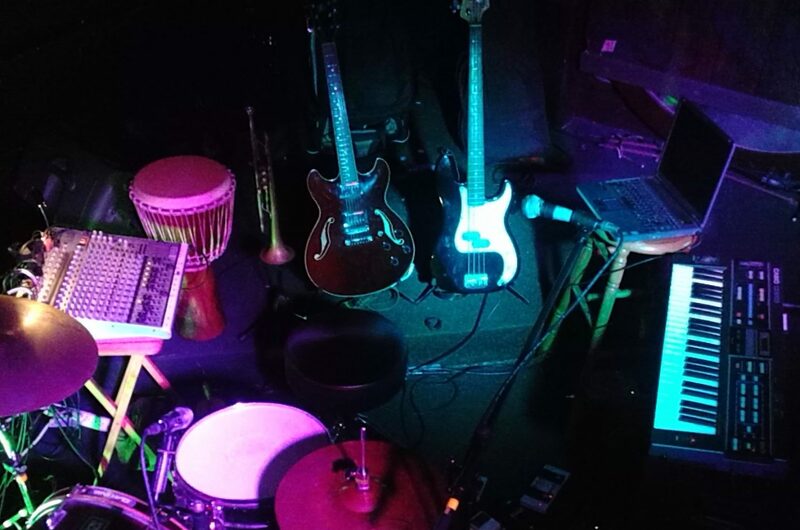 The Space Kadets combines loop technology and live instruments, with original songwriting and improvisational creativity covering a wide spectrum of genres and sounds. He plays a variety of instruments (drums, percussion, guitar, bass, tin whistles, trumpet, keyboards) and features guest musicians and vocalists at every unique performance. Steven’s CD “Into the Blue” was released in 2005 and features original compositions spanning over a decade of songwriting, recorded in Cape Town, South Africa and on the North Shore of Oahu, Hawaii. It is available on itunes and at CDbaby.